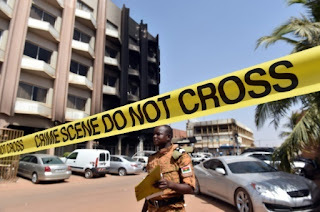 Ouagadougou (AFP) - Al-Qaeda in the Islamic Maghreb (AQIM) Monday named three gunmen behind a deadly attack on a luxury Burkina Faso hotel that has highlighted the growing reach of jihadist groups in west Africa, as French police joined in the probe. Burkinabe troops fanned out across the capital, Ouagadougou, with security stepped up at key sites as visiting Benin President Thomas Boni Yayi pledged that west African nations would fight back against a mounting terrorist threat. "We're not going to just sit on our hands. We will react and respond," he said, speaking on behalf of the 15 regional nations. "The question is whose turn is it next," Boni Yayi added. "The terrorists who think they can take our youngsters away from us are wrong." Friday's attack by Islamist gunmen on a four-star Ouagadougou hotel and nearby cafe left at least 29 people dead, around half of them foreigners. First such incident in the country, it came weeks after Islamists claimed an assault on a top hotel in Bamako, capital of neighbouring Mali, where 20 people died. At the crime scene, an 18-strong team of French investigators, including forensic experts, joined local police in white coats combing for clues at the Splendid hotel and Capuccino cafe stormed by the gunmen. At least 14 or 15 foreigners, including a nine-year-old, and seven or eight Burkinabes were among the dead, according to differing tolls given by the government and the public prosecutor. Seven bodies have not yet been identified. The French foreign ministry said 30 people had been killed and 20 identified. In a statement carried by US-based monitoring group SITE, AQIM said the Splendid Hotel was "one of the most dangerous dens of global espionage in the west of the African continent." The operation, claimed by AQIM in the early hours of Saturday morning while the attack was still ongoing, was a "drop in the sea of global jihad," the statement said. In their earlier statement, AQIM said the gunmen were from the Al-Murabitoun group of notorious Algerian extremist Mokhtar Belmokhtar. Authorities in Burkina Faso have said that the bodies of three assailants had been identified, but several witnesses said they saw more than three attackers and a manhunt is still under way for accomplices. Burkina Faso has declared three days of national mourning following the onslaught. "People are afraid. Anyone who's not afraid isn't normal -- this is guys with guns," said Souleymane Ouedraogo, who lives near the scene of the violence. Until recently Burkina Faso had largely escaped the tide of Islamist violence spreading in the restive Sahel region and the hotel assault will heighten fears that jihadist groups are casting their net wider in search of targets in west Africa. President Roch Marc Christian Kabore, who took office just last month, said west African states needed to work together. "We need to share information and military means," he said. "This is an asymmetrical war and we need to train our army for this new type of combat." The attack began around 7:45 pm (1945 GMT) on Friday when an unknown number of attackers stormed the 147-room Splendid Hotel in the heart of Ouagadougou. The hotel and surrounding area became a battleground as Burkina Faso troops, backed by French forces based in the city under a regional counterterrorism initiative, launched an attempt to retake the hotel around 2:00 am. Internal Security Minister Simon Compaore said the foreign dead included four Canadians, three Ukrainians, two French nationals, two Portuguese, two Swiss and a Dutch person. The US State Department said one American was killed. Burkina's public prosecutor Maiza Sereme said 15 foreigners were killed and gave a slightly different breakdown of the nationalities. In a reminder of the fragile security situation, an elderly Australian couple were kidnapped on Friday in Burkina Faso's northern Baraboule region, near the border with Niger and Mali. Malian militant group Ansar Dine told AFP the couple were being held by jihadists from the Al-Qaeda-linked "Emirate of the Sahara". The pair had been running a surgical clinic in the north of the country since 1972, and no reason has been given for their kidnapping, a statement from their family said.